Cauliflower Rice Tabbouleh ~ a twist on Middle Eastern cracked wheat salad, made low carb and gluten free with cauliflower rice. It's a healthy vegan salad. Remove the bottom core from the cauliflower and break into sections. Remove most of the stems, and break apart into large florets. Add the florets to the bowl of a food processor. I do this in two batches. Pulse the machine, about 20 to 30 times, stopping a few times to scrape down the bowl and check the progress. You want the cauliflower to become evenly and finely crumbled. Pulse a few more times if necessary. Turn the cauliflower rice into a large bowl. Put a tablespoon of olive oil in a skillet and toast the pine nuts over medium to medium low heat until they turn fragrant and nutty brown. Stir almost constantly so they don't burn. Add the tomatoes, cucumber, onion, and fresh herbs to the cauliflower and toss to combine. Whisk the dressing together and taste to adjust to your liking. 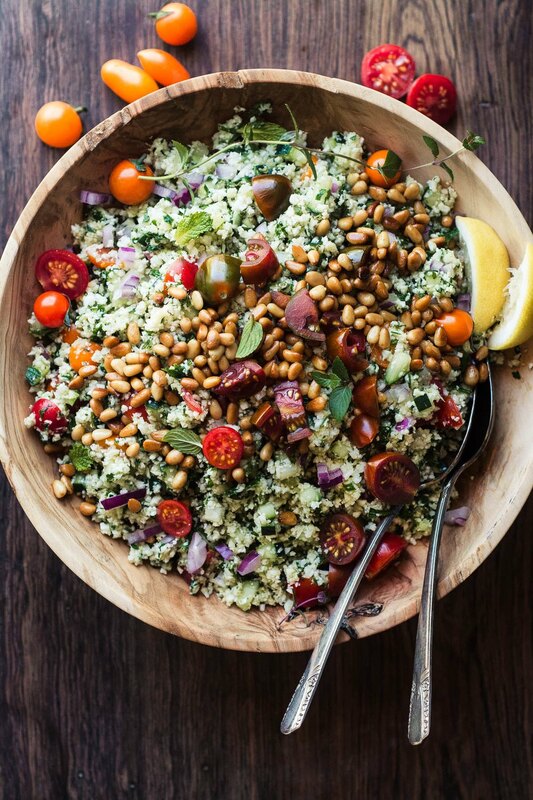 Toss the tabbouleh with the dressing, then top with the pine nuts, fresh mint leaves, and lemon wedges.